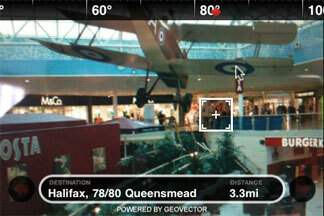 World Surfer is the latest in a line of 'Augmented Reality' apps to be released. Augmented Reality or AR solutions merger computer imagery or data with a live view of the real world and World Surfer uses AR to great effect. 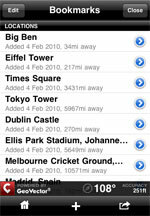 Available for iPhone 3GS and compass equipped Android phones, World Surfer is, at its most basic, a search app. Fire it up and you are presented with a number of options; Microsoft Bing, Google, Wikipedia, Coffee and Toilets. 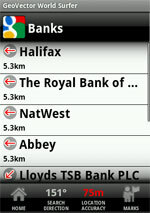 Choose a search option, point your handset in a direction and the search results appear. 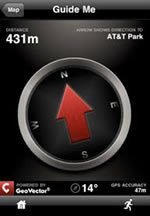 As you rotate the phone the search results update in real-time to reflect your new orientation. 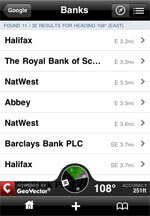 You can view the results on a map, receive contact information, directions and compass bearings including distance or view the results in real time using the camera with the search result highlighted. 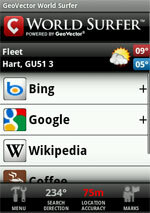 World Surfer also provides a localised 5-day weather forecast, the ability to save custom searches and bookmark the search results. GeoVector, the San Francisco company that developed World Surfer are to be congratulated for an app that is simple to use and has an intuitive interface that works well. And on top of all that, World Surfer is available in both the iTunes Appstore and Google's Android Market FREE. Indeed not, I confess I hadn't noticed that as missing but have just asked GeoVector and they have answered that whilst not present, it is 'coming soon' to Android.